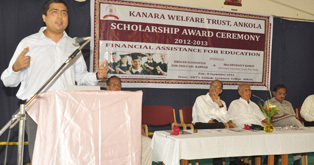 Kruger Foundation, Karwar, in collaboration with Shri Devadatt Kamat, young Advocate of Supreme Court of India, and a man of vision, have come forward to sponsor this new project, “Financial Assistance for Education”, which will be executed by Kanara Welfare Trust to help the poor and deserving students of Uttar Kannada. Kanara Welfare Trust, pioneer Institution of Uttar Kannada District has been working for the cause of education and social upliftment for the last six decades. Its main concern has been the emancipation of the poor and downtrodden people of the district. 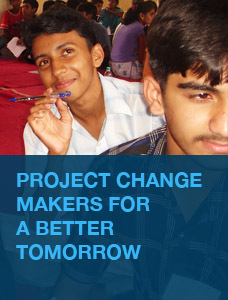 This project provides financial assistance to those who, due to lack of financial resources, are deprived of pursuing higher education. 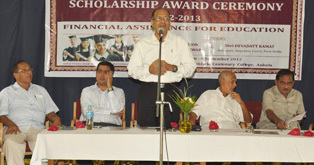 The first SCHOLARSHIP AWARD CEREMONY took place on 8th September 2012 at Ankola. Shri K.V.Shetti, Administrative Officer of Kanara Welfare Trust welcomed everyone and read out a brief report regarding the project. 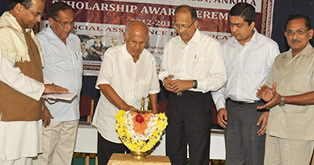 The Scholarship Award Ceremony was formally inaugurated by lighting the traditional lamp. Shri Vishnu Naik, Retd. 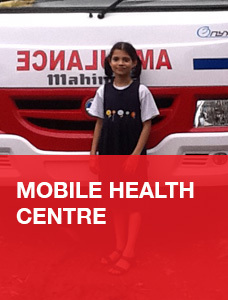 Principal, introduced the dignitaries to the audience. Shri S.P.Kamat, Chairman, Kanara Welfare Trust and also Chairman of Kruger Foundation for Child Aid, Karwar, gave the presidential address.